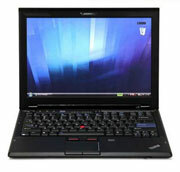 Posted on June 23, 2008 by D.C.
Over at the Lenovo “Inside the Box” blog, Matt Kohut reported on swapping his existing 7200rpm 2.5-inch hard drive for a 1.8-inch 64GB Solid State Drive (SSD) in his ThinkPad. It did involve using an adapter from a 1.8-inch form factor to a 2.5-inch form factor. This was the same 1.8-inch 64GB Samsung SSD found in the 13.3-inch Lenovo ThinkPad X300. Using Acronisâ€™ Migrate Easy software, he copied everything over to the SSD using an Ultrabay adapter, then replaced his existing mechanical hard drive with the SSD. # This drive definitely runs cooler. I canâ€™t even feel it under my palm rest like I could with my old drive. # Battery life has definitely improved. When I am actively using my PC, I get about an extra 20 â€“ 30 minutes per charge. When Iâ€™m doing something more passive (at least from a system perspective) like email, my battery life is now about an hour longer than before. This entry was posted in Articles, Lenovo, Reviews, Samsung, Solid State Drives. Bookmark the permalink.